Jaeger-LeCoultre joined hands with German artist Jonathan Meese in creating a special customized design for the case-back of the Grande Reverso Ultra Thin Tribute to 1931. Created in 1931, in response to a challenge set by British colonial army officers stationed in India, who wanted an elegant watch capable of surviving a polo match, right from the start the Reverso was far more than just a sports watch. The steel or gold back that could appear by turning the watch was going to write a new page in the history of watchmaking. A clean page that would make the Reverso much more than a watch: a cult object that every Reverso owner could make unique by personalising it. Both the Reverso as well as Jonathan Meese are icons – the result of the collaboration is an exceptional time-piece of art issued in two copies only. 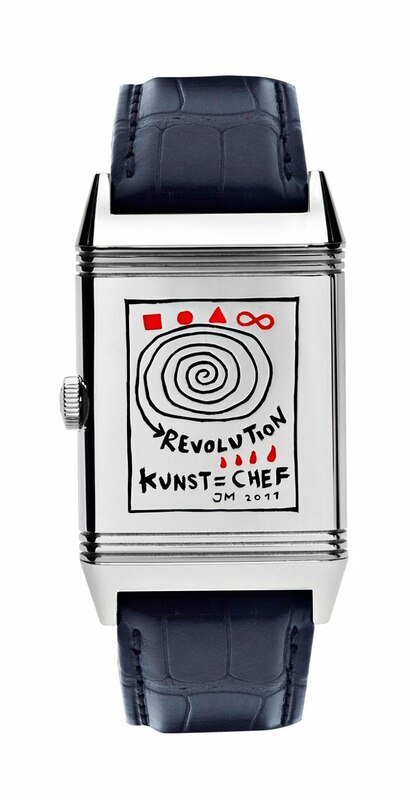 Art- as well as watch-lovers now have the possibility to exclusively buy one model of this Jonathan Meese designed Reverso. The proceeds will be given to the German Apoplexia Foundation. Founded in 1993, it advocates a modern and efficient care for patients who suffer from apoplectic strokes. In Germany almost 270.000 persons per year suffer from a stroke. Of course, this affects above all elderly people, but also around 300 children suffer an apoplectic stroke every year. Around 64% of these patients remain handicapped and are in need of care. The German Apoplexia Foundation has initiated over 480 self-help groups and has been offering continuous support. Over 200 specialised wards, so called “Stoke Units“ were certified by the German Apoplexia Foundation. Jaeger-LeCoultre is more than happy to have the possibility to work together with German artist Jonathan Meese and contribute to such an important cause. Jonathan Meese is a painter, sculptor, performance and installation artist based in Hamburg and Berlin. His works include collages, drawings and writing. A lot of prestigious collections own works of Jonathan Meese, like for example the Centre Pompidou in Paris, the Saatchi Gallery in London and the Städel Museum in Frankfurt. The central theme of his works are personalities of world history, myths and heroic sagas. They are sold for prices of up to 60.000 Euro. Those who are interested in buying the watch, should send an e-mail with their bid to rosenball@svr-pr.de. Via this e-mail adress bids can be placed until June 17 at midnight. The minimum bidding price is EUR 6.250,-. As soon as the e-mail was received, the prospective buyer will receive an e-mail confirmation with the information about the current highest bid.